In Germany, UFOP reports that because of the U.S. trade dispute with China and the resulting limited export potential, U.S. farmers are growing fewer soybeans. In most U.S. states, farmers have likely planted fewer soybeans in 2019. 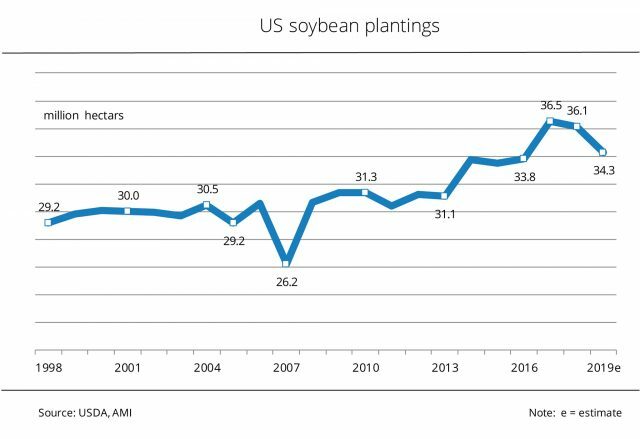 This assumption is based on figures published by the USDA, which expects the 2019 US soybean area to comprise 34.3 million hectares. This translates to an almost 2 hectare drop from the previous year. The decline is probably first and foremost due to the trade dispute between the U.S. and China. For months, China did not by any soybeans from the US at all. The country now places at least sporadic orders, but these are always followed by long pauses. In addition to the 3 per cent increase in harvest, this has forced down producer prices for soybeans, which are around 7 per cent below the year-earlier level in the current season. Trade flows are not expected to return to normal while the conflict continues. Farmers are drawing the necessary conclusions and are likely to cut the production of soybeans in favour of other field crops. Moreover, many of them are still stuck with huge stocks. The USDA has put US soybean stocks on farms at 34.6 million tonnes as at 1 March 2019. This is up almost 50 percent from the same time a year earlier. In other words, in the first half of the running marketing year only 40 per cent of the harvest was marketed. This figure compares to 52 per cent in the same period a year earlier.